It is with some difficulty and hesitation that this chapter is begun, Although there is undoubtedly a resumption of Club activities almost immediately after the cessation of hostilities in 1946, the author has not been able to locate any written evidence of such, earlier than the recording of the results of the 1949 Christmas Handicap. Significantly this event was won by a very young S.T. Rogers; a runner who was to figure prominently in the Club’s annals over the next twenty years. There is an old music hall song called “Following in fathers footsteps”. Whether or not Ted Rogers sons ever knew it, we do not know; but follow in the footsteps they certainly did. The names of Brian, Vincent, Steve and Peter, show repeatedly throughout the 1950s and 1960s as the next generation carried on where there father left off. One of the pre-war members who did come back with that irrepressible enthusiast Bert Searle. He quickly re-established himself as one of our most consistent and reliable runners. In 1949 he won the Club Senior Cross-Country Championship, beating his old friend Andy Byrne and Bob Mount into 2nd and 3rd places respectively. On the 8th April 1950 we were strong enough in numbers to field two teams in the annual Sefton Park Road Relay. In those days it was known as the “marathon” relay due to it’s format of 8×3 1/4miles which add up to the magic figure of 26 miles. On the 7th and 8th legs for the “A” team Vin Rogers and Bert Searle recorded our joint fastest times of 18.28, and in the “b” team a young stripling named Reg Vaughan ran a time of 19.02 for his stage. A month earlier at West Derby, Bert Searle had retained the Club Cross-Country Title, having to beat Andy Byrne to do so. The Junior Championship over 5 miles was won by Les Evans in a time of 32.20 while Steve Rogers gained the first of his many Club Championships in winning the Youth’s race over 3 miles. After the inactivity of the war years, Sefton were back obviously on the move again. The summer of 1950 saw us with a full programme of Club Track Championships. The dominant figure was Arthur Dunn; who won the 100yds and 440yds in 10.5 and 56.0 respectively, and Alf Glaister; 1st in the 880yds and 3 miles and 3rd in the 1 mile. Alf along with his brothers Bill and Frank formed part of the backbone of Sedton in the early 1950s. Amongst the other runners in these Championships was our President Reg Vaughan, who was second in the 3 miles race. The 1950/51 cross-country season opened at west derby when we staged the traditional Monster Meet on 7th October. this took the form of a mass social run until the pack reached a designated place one mile from the finish. Everybody then lined up for the “mile break”, which was in fact a race for home. On this occasion there were 178 runners, and appropriately our own Reg Vaughan won the 1st novice prize on the home course. to further emphasis Sefton’s return to the “arena” we had, earlier in the summer, three competitors in the Liverpool City Marathon; Bob Mount, Vic Dennis and Bert Searle. This season saw Sefton fully involved in the cross-country scene, and although no Championship victories came our way, we finished a respectable 4th in both the Liverpool and District and the West Lancs Championships. There were several inter-club events in which we had mixed fortunes; the season winding up with our own Club Championships at West Derby in March. Les Evans the previous season’s Junior Champion, further proved his ability by this time winning the Senior event from Reg Vaughan and Frank Glaister. The Junior Championship had been won by a very promising first season runner; Jim Sampson, who was alter to become Senior Champion for two seasons. “At 11.20 pm . The Lord Mayor and the Lady Mayoress (Alderman Vere Cotton and Mrs Vere Cotton) together with the Bishop of Liverpool (Dr Clifford Martin) and Mrs Martin and other guests, entered three open landaus at the Town Hall. As they came from the building, crowds facing the Town Hall cheered and nine members of Sefton Harriers, with blazing torches formed a guard of honour to the civic party. One of the Harriers took up position at the head of the procession in front of four mounted police with plumed helmets and drawn swords, and led the way running to |St Georges Plateau. As the landaus passed along the route they were greeted by cheers from spectators standing twelve deep. As soon as the civic party had passed, street lighting was automatically extinguished”. The members forming the guard of honour were Bert Searle, Frank and Alf Glaister, Arthur Dunn, H. Hampson, Bob Mount, Reg Vaughan, and Barker. Stirring Stuff! What a pity, events like this do not happen since Liverpool lost it’s Lord Mayor. Charlie Ellick was awarded the Neville White Trophy for being the first man home from a local club. The Club’s road running strength was obviously improving as later on in November we gained the 1st Liverpool and District team award in the prestigious Water Road Race. On the 13th October in the Lancashire Road relay Championship at Southport, Sefton finished a creditable 7th; Reg Vaughan being our fastest man on the day. Not neglecting the social side of things; the relay was followed by a coach trip to Blackpool Illuminations which was enjoyed by all. The 1951/52 season was anticipated with optimism; the feeling being the Club was at it’s strongest since the War. At the A.G.M on 21 September Ted Rogers stood down as Hon Secretary, and his place was taken by an enthusiastic new member, Les Earlam. Les was to hold the post for five years, during which time he carried out some fine work and the Club’s stature grew year by year. It was during this year season that the tide of events began to turn in Favour of Sefton, and the hard groundwork that had been going on for a few years, began to yield positive results. On the 26th January 1952 in the Liverpool and District Championships at Arrowe Park, although our Seniors could finish only 5th team, our own Jim Sampson was 3rd in the race, and won the 1st unplaced medal. (Subsequent research indicates that Jim Samson was not third in the L&D championships that year but was first unplaced) that Our Youth team giving a warning of things yet to come, took the bronze team medals as did our Boys in their race. To prove that this was no fluke, the Youths struck again at the West Lancs at Sherdley Park on 9th February, when they won the team race with 50 points, placing 6,7,15. and 22. This fine victory must have inspired our Seniors to greater efforts for they finished in third teamplace with 110 pts; the scorers being J. Sampson 14th, L. Evans 16th, C. Ellick 18th, R. Vaughan 19th, W. Glaister 20th and Club Captain Bert Searle 23rd. What packing! They must have been within touching distance of each other. A keenly fought Club Championship on the 29th March saw Jim Sampson win both Senior and Junior titles, with the Youth’s race again going to Steve Rogers, and E.Alker winning the boys event. In the Sefton Park Road Relay on the 5th April, Sefton with their increasing self-confidence, were making the running at the front when the newly found talent of Alan Woolridge ran us into 2nd place on the 3rd stage. Although the race was won by Wirral A.C our 4th position at the finish showed the level of our improvement. Uncountable the high spot of 1952 for Sefton was Charlie Ellick’s victory in the Doncaster to Sheffield Marathon, which incorporated the Northern Counties Championship. This happened on the 14th April over what marathon runners of the day considered to be the toughest course in the country. it brought tears of pride to many old Seftonians eyes, and evoked memories of the heady days of Sep Frankcom and Jack Rimmer. Charlie’s winning time of 2.41.24 may not appear to be very fast in comparison with today’s performances, but one must view it in it’s contemporary context. the great Jack Holden of Tipton Harriers had won the race on the two previous occasions, and had not bettered Ellick’s. When one considers that Holden was both Empire (Commonwealth) games and European Champion, it does show the real worth of Charlie’s Ellick’s performance. Charlie, who was a member of Reading A.C before joining Sefton, continued his success that summer by winning the Peterborough Marathon an Whit Monday in a time of 2.38. On june 14th, however in the Polytechnic Marathon, which included the A.A.A Championship, he did not run up to form and could manage only 32nd place in 2.47.13. In this race he was ably supported by Bert Searle and Andy Byrne in 47th and 101st places respectively. While the road men were going about their feats of endurance, our track and field men were turning in some splendid performances for Sefton. The names of Jim Sampson, Alan Woolridge, and Alf Glaister were doing rather more than keeping the black and white flying. In a match against Liverpool University and Waterloo Harriers on the 12th June they all won their events; namely 3 miles, 1 mile and 880yds respectively. We cannot boast of having a number of Field events men in Sefton, least of all throwers; but around this time we acquired a new member called R.Grant. His natural talent was immediately obvious, and for several years Ron Grant along with Bill Mann made a formidable pair in the field for Sefton. It is a sad irony the strong man, should die of cancer in the 1970s. His close friend Bill Mann was to become Lancashire Shot Putt Champion, and although a gnarled veteran, is still competing for Pembroke A.C. Bill reluctantly left us a few years back to seek competition, when due to our low state at the time, we were unable to utilize his talents. Although Bill is now a member of our friendly rivals Pembroke, he considers himself still a Seftonian at heart; and so do we all. the 1952 Track and Field Championships were dominated by the name of Alan Woolridge who won the Junior 440yds, the Junior , Senior Mile and Senior 3 miles. Arthur Dunn retained his 100yds title in 10secs but he had to concede to the new track talent of Derek Lovelady in the 440yds. 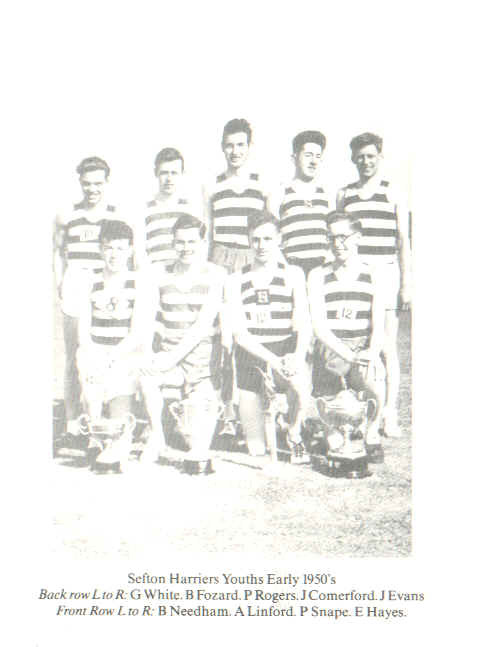 Derek, son of Albert Lovelady, a prominent member of Sefton in an earlier era, was one of our most talented track athletes of the post war years, and in 1956 and 1957 won the Lancashire and Northern Counties 880yds Championship. The improvement in the Club’s track performance at this time was due in no small way to our Coach Walter Hankin. Walter was one of our track men of the pre-war years and a team mate of Ernie Cottier. He was a first rate coach and much respected by all members. From the 1952 handicap comes an interesting father and son result; with a young John Kay first across the finishing line, whilst his father Bob, won the veterans prize. Both Bob and John served the Club as Hon Treasurer for several years. Bob died some years ago, and John, who moved to North Wales, is now a member of Wrexham A.C. Like Bill Mann, his heart is still in Sefton and he visits us from time to time. The 1952/53 cross-country season, while it brought on honours, did produce a couple of individual performances of note. In the Liverpool and District Championships, Graham White won the 1st unplaced medal in the Boy’s event, and A. Ravenscroft gained a similar distinction in the Junior race. Ernie Cottier’s nephew Mike Batty won the first unplaced medal in the West Lancs Championship at West Kirby in February 1953. This was a foretaste of what was to come from this classy runner, in the future. With the winter season behind them, Sefton entered the spring and summer season with the customary enthusiasm, finishing 4th in the Sefton Park Road Relay. The new names of Chris Marsden and Mike Hoyland were well in evidence, returning the fastest times of the day. In August, at the Liverpool Cooperative Society’s Athletic Festival, Sefton Harriers won the Highfield Trophy. This was awarded to the club with the best overall performance in the track and field events for the whole of the meeting. For number of years the Coop track at Fazakerley was our training headquarters and the annual summer athletics meeting was very well supported and keenly contested by local clubs. Wolverhampton to Stafford Road Race, Doncaster to Sheffield marathon, and of course the Liverpool City marathon, in which Charlie Ellick was 4th, to regain the Neville White Trophy which he had won in 1951. Sefton also won 3rd team prize in this event. In the Doncaster to Sheffield race on Easter Monday our only representative was Vic Dennis. It is worthy of recording that Vic who was a cyclist , rode to Sheffield on his bike the day before the marathon and was caught in a snowstorm on the Snake Pass on the way there. They bred them tough in those days!. The Track and Field Championships were hotly contested, and winners from the previous years were being challenged. by Alan Wooldridge’s twin brother Ken, who took the Senior Mile in 4.35, and by Steve Rogers who won 3 miles in 15.25. Ken Wooldridge was also second in the 3 miles and 880yds. With the infusion of new blood over the previous year or two, the health of the Club was improving and looking at the team for the Lancashire Road Relay that year, it was obvious that the old guard were having to give way to claims made by the next generation of Seftonians; which is of course as it should be. Bert Searle, Les Evans and Reg Vaughan were able to retain their places, but in generally the team had a much younger look about it, with Steve Rogers returning our fastest time of the day in 16.03 for the 3 1/4 mile course. The winter season of 1953/54 brought several good individual performances from our members. Our newly elected Captain Chris Marsden was first home in the mile break at the Monster Meet. we also had Tony Linford in 3rd place. This was a good season for Chris; being the fastest loser in the Christmas Handicap and our most consistent high finisher in the cross-country fixtures over the season. In the Liverpool and District Championships at Broadgreen in January, Mike Hoyland won the 1st unplaced medal in the Senior race, while Steve Rogers gained the same award in the West Lancs Championship in February. The Youth team were beginning to establish itself, for in the Liverpool and District Championships they were 2nd team, and were 3rd in the West Lancs. In the midst of this catalogue of results and achievements, it is worth pausing awhile to contemplate an overview of the Club’s situation at this time. From the study of records available, it is apparent that we had got over the difficult post war reestablishment phase, and we were now entering a a period of comparative success, with a prospect of greater things to come. A great deal of credit for our being in this happy state must go to a group of men who were the backbone of the Club during those years. J.T. Rimmer was still our President. As has been stated at the opening of this chapter, the author has no written records available for the war, and the immediate post-war period, so it is assumed that J.T Rimmer was Mr Harry Goldbourn’s successor as President when Mr Goldbourn died in 1940. Jack Rimmer held office until 1961, and the respect in which he was held by all in local athletics, was a source of strength to the Club. This was compounded by Jack’s own staunch loyalty to Sefton Harriers which did not waver during his 50 years as a member. We all appreciate the fact that a running club cannot function satisfactorily with runners alone and in this respect, Sefton has always been blessed with men who are willing to serve the Club in various capacities which are so vital. While we were getting back on our feet again during the period after the second world war, the work of Ted Rogers, Stan Lubbock, Les Earlam and Bert Searle went on behind the scenes; ensuring the continuing existence of Sefton Harriers. As one who was Club Captain for four years, the author considers Bert Searle, who was Captain from 1951 to 1956, with a one year break in 1954, as one of the Sefton “greats”. His youthful enthusiasm, which still exists today at the age of 76, his openness and friendliness played an important part in welcoming in those promising young athletes who joined in the early 1950s, and added so much to the effectiveness of the Club. Bert is everything a Club Captain should be!. Sefton’s team in the 1954 Sefton Park Road Relay had a very youthful look about it, with only Andy Byrne being the only survivor of the old guard. We finished a good 3rd after Chris Marsden ran into 2nd place on the 1st stage in our fastest time of the day. A month earlier at the Northern Cross-Country Championships, our Youth team gave a hint of things to come when they finished6th in the team race, with Brian Fozard 8th, Peter Snape 10th, Eddie Hayes 27th and John Evans 31st being the 4 counters. Having the cross-country season behind them, our runners tackled the summer of 1954 with enthusiasm and a growing confidence in themselves; recording several worthwhile achievements. Richard Bradley was the Lancashire Junior High Jump and Shot Putt Champion. In the same Championships Graham White was winner if the 440yds in 53 secs, Tony Lindford showed his remarkable versatility in by winning the 1 mile walk. One of our Chester connections, Mike Batty, became the Northern Schools Senior Mile Champion in 4.35 secs. Andy Byrne was having a good year on the roads, recording 2.52.26 in the Doncaster to Sheffield marathon and 2.03.43 in the Pembroke 20. Charlie Ellick recorded an excellent 2.33.41 in the A.A.A marathon when he finished in 8th position. During the two previous seasons our young runners had put in a lot of hard work and promised much. This came to fruition in the 1954/55 cross-country season when they did strike gold. Steve Rogers won the Liverpool and District Junior Championship, our Youth’s carried off the gold medals in great style with Brian Fozard winning the individual title. Earlier in the season Brian had also won the H.S. Finney Trophy Youth Race at St Helens. The West Lancs Championships were virtually a repeat of the Liverpool and District; Steve won the Junior title, Brian Fozard won the Youth’s, and the Youth team were 1stagain 1st team. To follow these performances in the appropriate fashion, Sefton Harriers became Northern Counties Cross-Country Youth Champions; our first man home being Tony Lindford in 6th Position. But for a stroke of bad luck we were set to crown this great season with a victory in the National Championships. Eddie Hayes, who was running in about 50th place one mile from the finish, and our 4th counter at the time, had shoe trouble and had to stop to take them off. In such a large field, this cost him many places, and his finishing position was 351st. Our four counters were B.Fozard 22nd, A.Linford 37th, P.Snape 42nd and B.Needham 139th. we were eventually placed 4th team. The decade that had begun with a mixture of faith and belief inthe Club, by the old guard; combined with the introduction of new talent, was now turning out to be one of the most successful periods in our history. The all conquering Youth team of the mid-fifties, were in another two years, to repeat their success in the Junior Division. 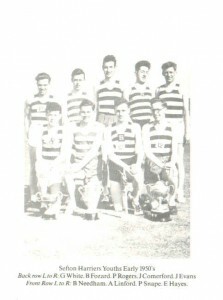 By 1956/57 season we had a formidable array of talent in Sefton Harriers. Most of the real strength was in the Junior ranks, but in combination with the Seniors, spearheaded by Steve Rogers, and Club Captain Chris Marsden, we became Liverpool and District Cross-Country League Champions, being unbeaten in each league fixture. This mix of Junior and Senior brought us victories in the H.S. Finney Trophy, and history was made Sefton became the first Liverpool and District club to ever win the prestigious Waterloo Road Race. In a thrilling race we tired on points with Pembroke; the decision going to Sefton our 3rd counter was just one place ahead of Pembroke’s third man. Our three counters on that famous occasion were Steve Roger 3rd, Brendan Deary 11th and Brian Fozard 12th. the author who was in his first competitive season with the Club was 8th counter in 78th position, and remembers it as one of the most exciting occasions occasions of his running career. Steve Rogers, who in 1955 and 1956 had been West Lancs Junior Champion, added the Senior title to his list of achievements when he surprisingly beat International runner Ken Gates of Pembroke in the 1957 at Speke. This was a reversal of the result a few weeks earlier, when Ken Gates had beat Steve to win the Liverpool and District. Further successes in this remarkable season, were our team win in the H.S. Finney Trophy at Leyland, and Mike Winterton’s individual victory at the Liverpool and District Championships; followed by his triumph in the Northern at Morecambe. In the Liverpool and District Championships at Port Sunlight our combined Senior and Junior team finished in 2nd place. At the West Lancs however, the junior team were their head and were placed 2nd on their own account with Fozard, Deary, Pete Rogers and John Evans being the scorers. Morecambe was the venue for the Northern Championships that year, and the weather and the course were such that it put the toughest of athletes to the test. The course itself was a hazardous mixture of icebound ground and feet deep clinging mud. Back at the changing tent conditions were not much better; even inside the tent one had to struggle with shoes while standing up to the ankles in mud. The individual winner of the Junior Race was that great runner Gerry North of Blackpool, but not far behind was Brian Fozard running the race of his life to finish 3rd; leading Sefton Juniors to a remarkable victory. Running for a weakened Senior team, Steve Rogers finished a fine 7th. A few weeks later in the English Championships at Parliament Hill Fields our Junior team put the seal on a wonderful season for Sefton by finishing 3rd position in the team race. 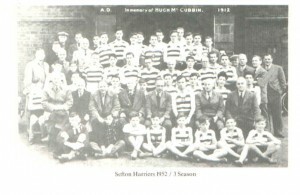 During the next 5 to 6 years there were many good performances by Sefton teams and individuals: in 1958 Eddie Forde won the All-Ireland 880yds Championship; P.O’Hare was Lancashire Junior Shot-Putt Champion; Mike Winterton was still in winning form to take the Cheshire Schools Championship. The bronze medals in the 1958/59 West Lancs Championships came our way, with Steve Rogers 2nd and Bredan Deary 3rd. The following year, Steve continued his remarkable consistent form with a 3rd place in the West Lancs at Sherdley Park, and Brian McCann, following Mike Winterton’s footsteps, won the Boys race in the Liverpool and District Championship at Wavertree. We did not win the League again, but our performances did not disgrace us as we gave as good as we took: winning some and losing some. Around about this time our Captain Chris Marsden withdrew from the running scene, and Norman Wilson was elected to that office, which he was to hold for the next four years. Although a steady and reliable performer over the country, his particular forte was long-distance running, turning in a series of sub 2.40 marathons during his years as Captain. He represented Sefton in the hitherto untried area of running; i.e. Ultra long distance, when in 1959 he took part in the Liverpool to Blackpool road race, finishing in 3rd position in 5hrs 27 mins. During his Captaincy we were once again invited to run in the News of the World Manchester to Blackpool Road Relay. This was a very high powered event to which only the top twenty Northern Clubs were invited. Internationals and County runners were pretty thick on the ground, and although we did finish 20th out of 20 teams, everyone ran well on the day and we were not disgraced. The nucleus of runners at this time were S.T Rogers, A and K Woolridge, J.K and B Needham, D and T McKay, J and A Mansley, B. Fozard. J. Betney, M. Winterton, N. Wilson, Jim McCaffery, John Lyons, Ken Davies and John Evans. With hindsight, it can now be seen that the Club reached a peak in the 1956/57 season, and one can perceive the gradual downward trend afterwards. This was due to several factors; members getting married and their priorities changing, others moved to different parts of the country following their work and careers, and some who considered running a passing phase in their lives. Some of our young men left school to go away to University. Ken Davies, following years of hard training to make himself one of the best runners in the district, emigrated to New Zealand. We must be philosophical; we are in an amateur sport where one is not co-ereced. or should not be, and every now and again the happy combination of people, time and place, make for something special. 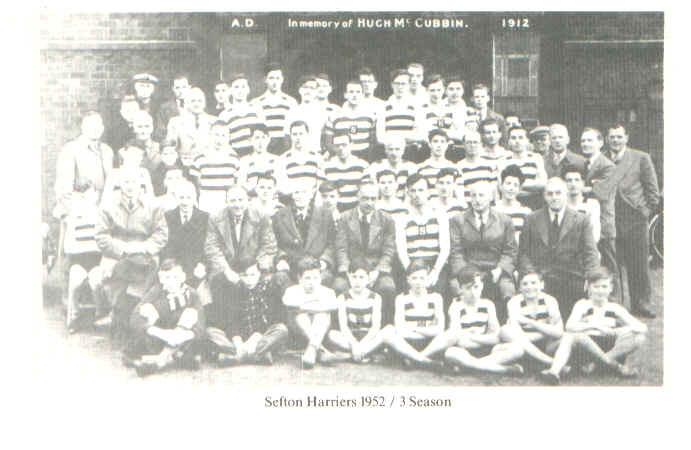 It happened to Sefton Harriers in those heady days before the 1st World War; in the 1920s and 1930s and again in the 1950s. It is happening now in the 1980s, when we are one of the happiest and healthiest Clubs on Merseyside, and respected again by all. But we race ahead too fast, and must not leave the early 1960s without particular mention of Brendan Deary and his achievements. Brendan joined Sefton Harriers when he was a Junior and doing his National Service in the Army. A keen runner who trained very hard, he immediately established himself in the Club, and was of course a member of the successful Junior team of 1956/57. In 1964 Brendan distinguished himself and brought honour to the Club by winning both the Liverpool and District and the West Lancs Championships. He gained selection for the Lancashire cross-country team for two seasons; seasons in which Lancashire won the Inter-Counties Championship, and so he won two winners medals. Following his career in the Youth Employment Service, he moved to Northern Ireland and continued to compete at a high level; gaining his All Ireland vest for Cross-Country. When he first moved to Northern Ireland, in keeping with his reputation for “rushing in where angels fear to tread”, he became the first ever Catholic member of the hitherto exclusive Protestant 9th Old Boys. This apparently caused a flutter of consternation among the old brigade, but his natural charm, and considerable running ability soon won them over. In 1961 the grand old man of Sefton J.T. Rimmer died, and with his passing went a link with a bygone age. An Olympic champion in 1900; winner of countless races in his long association with running, in addition to his career in the Police, Jack had lived life to the full. As well as a death to mourn, it was a life to celebrate. Our newly elected President was E.J Rogers. Ted’s son Steve who had so ably followed in his father’s running footsteps, was still winning the Club Championship up to 1966, and his total of 9 senior titles is an admirable achievement. From time to time in our history there have been brothers, and fathers and sons, as members of the Club at the same time, and the 1950s were remarkable in this respect. Ted Rogers and his son’s have already been mentioned. In addition , we had the three Glasister brothers, Bill, Alf and Frank as well as their father . There was also Ken , Brian and Jim Neeedham; the twins Alan and Ken Wooldrige; Chris and Albert Marsden and their father, Albert and John Mansley, Joe and Adrian Fitzsimmons and of course Bob Kay and his brother Harry and Bob’s son John. The mention of some of these names, brings to mind the Cumella and Memorial Cup races, and what may be called the St Edwards connection. The Cumella and Memorial Cup races were collectively, an annual cross-country event for schools in the Merseyside area. It was held for many years, and on in to the 1970s, when due to unavailability of suitable changing accommodation in the West Derby area, it was reluctantly discontinued. Dan Cumella was a member and benefactor of the Club in pre-war years, and the events were held in his memory. The race attracted the best of schoolboy talent, which of course included St Edwards College, who won the individual and team races several times. Many of their boys joined Sefton through the involvement in the Cumella Cup races as the names of Rogers, Comerford, Snape, and Fitzsimmons on the Club members list testifies. St Edwards were particular strong at the cross-country discipline; the lads being driven hard by on Brother Coffey, whose name, when recalled from the past, is calculated to bring a chill to the spine of any former St Edwards pupil who may read this history. Under the Captaincy of John Evans and John Mansley’ssecretaryship, there were signs of a breif renaissance in 1967 and 1968 when we met with some success through our marathon team of John Palmer, Bill Bruce, Norman Wilson and Bart Woods. In these Two years we beat Pembroke to win the Liverpool Challenge Trophy in the newly revived Liverpool Marathon which finished at the Wavertree Showground. In the 1967 event John Balmer was a superb in a Club record of 2.25.08. Unfortunately John left us to rejoin his former Club Pembroke and Bill Brice, a very promising young Scottish runner, transferred to Wirral. By 1969 Sefton’s fortunes were at a low ebb with scarcely enough active runners to field a full team over the country. It was Winston Churchill who coined the phase “our finest hour” to describe the time when this country was as it hard pressed during the darkest days of World War II. These oft quoted words would be most appropriate to Sefton situation at this stage of the Club’s history. Fortunately there was still a few of us around who cared enough about the continuing existence of Sefton Harriers to hang on doggedly and work towards a more promising future.